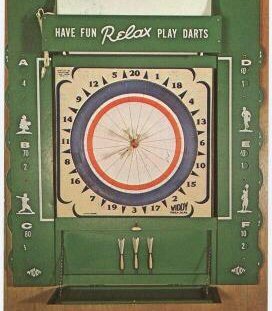 To play American darts, all you really need are darts and a board, both of which are markedly different from their pub dart counterparts. The boards are made of basswood. Some wound paper boards exist, but tournament boards are made of wood. There are wires embedded into the dartboard designating the scoring areas. 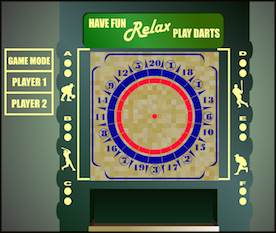 If the same innings on the board receive all of the attention, they will wear out before the rest of the board, sending your dartboard to an early grave. There are ways to counter this. There are three rings around the outside edge of the scoring section of the dartboard. The outermost is a blue ring that is not usually used in gameplay. The circular part of the board inside (and including) of the blue ring rotates. It is done by driving (old) darts into the blue ring, and turning the center. It can be difficult to rotate some boards, but doing so will prolong the life of the board greatly. This center is held in place by a couple of metal clips that you can't see unless you pop out the inside of the board. On several stubborn boards, I've taken a hammer to the blue ring and tapped them out, rotated them, and then tapped them back into place. This is probably not the best way to go about rotating a board (afterwards I've had to shim the center on occassion), but it works. Although the kind of wood used to make American dartboards tends to heal itself, when you poke enough holes in it they will eventually pull apart. In order to keep the size of the dart holes to a minimum, you should twist the darts out of the board. This does the least damage to the board. Grabbing a fistfull of darts and yanking them out of the board will do considerably more damage, and shorten the board's life. The point of the dart will make a difference on the board as well. On occassion a dart will hit a wire directly, or bounce to the floor, and the tip will bend. This can create a bit of a hook at the tip of the dart. Throwing hooked darts into a board will chew it up quickly. Each time you pull the dart from the board, that hook grabs some extra wood to pull out with it. I recommend keeping a small sharpening stone near your board to grind off any hooks, and just generally keep your darts sharp. Boards should have two sides to them, so besides rotating, you can also flip your board. Remember, half way through the front of your board also means half way through the back once it's flipped. So, when rotating and flipping your board, keep an eye on the worn spots and put forth some effort to keep them from lining up with each other. If you think about it, if inning number 1 gets a half of a hole in it, and then you simply flip the board, now inning number 5 has a hole behind it. That will make it much easier to eat a hole in the inning that will run all the way through the board. So flipping a board without rotating it is not the answer to a long board life. English pub darts with steel tips can kill a board quickly as well. Use Amercian darts on an American board! A list of dart board manufacturers is on the resources page. These are different from their pub counterparts. The darts have turkey feathers instead of plastic flights. The feathers are usually white, but you can find colored feathers if you look. The barrels are wooden, and generally thicker than a pub dart barrel. The tips are steel and they are glued into the barrel. The feathers of a dart will usually wear out before any of the other parts. When players throw darts in tight groups they will brush against each other, and this will fray them. Also, because the barrels are wooden, it's not uncommon for a dart to hit another dart's barrel and stick into it. This causes a piece of the wood to splinter off and leaves a burr. I suggest you have a piece of sandpaper near your board so you can sand off these burrs and bring the dart back to life. If you try shooting a dart with a burr, it won't be long until it sticks to your finger and the dart goes flying off in some odd direction, instead of where you were aiming. Another thing you should have near the dartboard is a potato. Lightly dipping the darts into the spud will coat them before shooting. It makes them stick easier. Potatoes are cheap, and should be disposed of at the end of the night. Despite the appetites of some shooters, dart spuds do not make "good eats". If you don't have potato handy, and darts are falling out of the board too easily, try using an onion, or a shotglass of water. 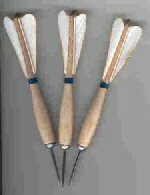 Several companies make American style darts. They are listed on the resources page. You should have a mark on the floor, at the very least, to indicate where a shooter should stand. Basically, you should have a "dart line", as in "Be Quiet, Tim is at the line!". There was a conversation about the rules for putting together a throw line in the old forums. It is preserved as a short article - Rules for an American Darts Throw Line. Oh yeah, the line is 7' 3" from the dartboard. From the front, or the back of the dartboard is the great American Dart debate. But a line at 7' 3" will get you as close as you need to be to start throwing.